I stamped the image, Lucky Friend, twice: onto green and white cardstocks. patterned papers, Sugar Plum Boutique Brad and Fancy Frills Lilac Border Stickers. 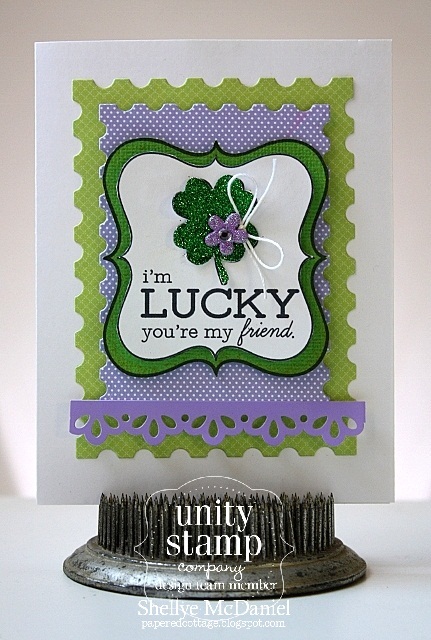 I just LOVE the lilac and shamrock-y green together! center of the image from the rest and then I layered with foam dots. With the size of the stamp, you could also use a round scallop punch to cut out the actual image. Don't forget to comment as you go! Great card, and I love the wine glass charms!! love them! i love that purple and green together and those tags are just stinkin' cute! Love the purple! so great with the green and love your designs. TFS. Love these projects! The card is fantastic - love the sparkle and the color combo, and what cute little tags! Love the color combo on your card and those wine glass tags are adorable! totally loving your projects!! the layered glass tags are fabulous and love the colors and shapes in your card!! Delightful sketch and love the glitter. The tags are so cute and like the layering. Your projects are great. Love all the layering on both. 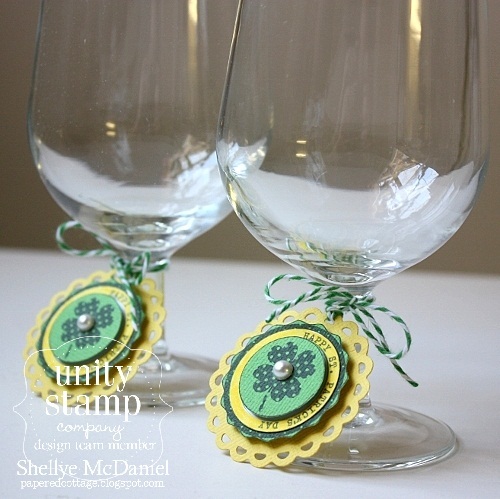 Adorable little wine tags and I agree that green and purple are a fantastic colour combo!! I love that sparkly green and purple combo, too, plus your wine markers are wonderful also. Love this card! Great colors and layering! Fun wineglass markers too! Love the little wine glass markers! And your card is fabulous too...I really like the unexpected lavender and green combination. Very cute wine glass charms, love them. Pretty projects! Love the purple you added on your card!! love the purple!!! love the images on the card too.. great projects!!! The card and the tags are fantastic! The color combo makes the card! 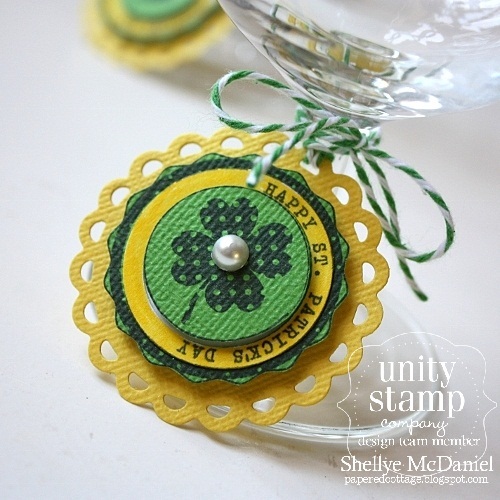 Love the card and sweet little tags!I never know what to combine with green for St. pat's day and that purple looks awesome!! SWEET wine glass markers! Great layers! I love your wine glass markers! So festive!! Love the glitter and the color combo on your card too!! You're card colors are great and your wine glass markers are adorable, I just love them! Everything you do is perfection and these are no exception. LOVE!!! So pretty! LOVE the fun color combos - especially the purple and green!!! I love those wine glass accents....would love to do this for my sisters house, we celebrate with dinner down her house every year...thanks for sharing! I love the "i'm lucky you're my friend!" card! It has such creative elements on it! Great looking projects! What a great looking stamp! Love it. I love green and purple~ great card! Shellye I just loved these projects today! Awesome projects! I love the card....purple & green is my favorite combo. Love the little wineglass markers, those are adorable! I love the purple with the green - a great combination of colours! I love your projects, but especially love the lavender and green on that card! 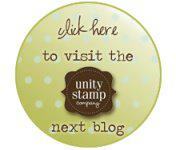 I love the versatility of Unity Stamps. the different types of projects you ladies show us inspire me so much! so so cute!! I love those wine glass indicators!! love the wine charms -- such happy polka dots. I love the card! The wine glasses are super cute too!! What a cute card and the tags are so fun and cute! Cute projects! Loving the green! Love, love, love it! The colours of the first card are perfect. And i love how you used the stamps for something other than a card or layout with your wine glass markers! Great work! love your card, love the lilac and green combo too. 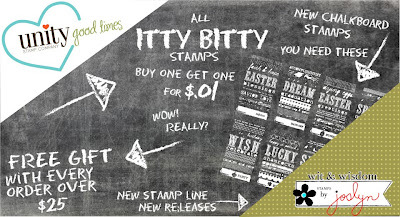 Love the stamps you used, great projects! Wow, I love purple and green together so your card really jumps out at me. I love it! And those glass tags...great use of the stamps. I am gonna have to remember to make some of those! Beautiful colors -- love the purple and green combo. Those are some fabulous winemarkers! Love the color choices! adorable wine charmes! ♥ great idea!